I know I say I love a lot of authors…but Nalini Singh is in a class by itself. She’s absolutely in my automatic-buy and, if I had any doubts of that status, her latest book Archangel’s Enigma would have certainly put her there. 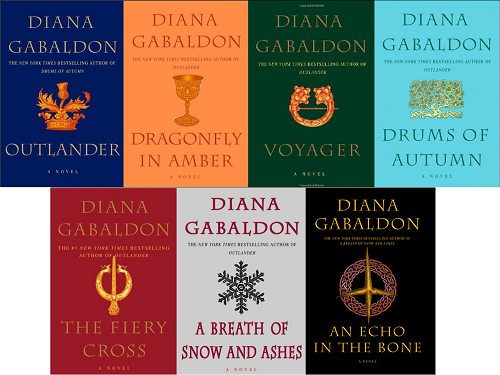 Reading one of her books is never enough and I often have to go back and reread the entire series to get some sort of handle on my addiction to her writing. She’s that good. This book is part of her Guild Hunter Series but don’t let the fact that it’s not the first in the series deter you. Each one is contained and you can read them alone. I often go back and forth reading one and then randomly picking another to read. Each one is different with a different hero and heroine and each one has its own particular magic. Archangel’s Enigma is Naasir’s story. He’s one of Raphael’s Seven, a dedicated group of warriors that stand by his side. Each man has his own history, characteristics and unique attributes. The only thing they have in common is that they’re simply fascinating. Naasir is no exception. He’s feral and loyal to the Archangel of New York, so when Raphael gives him a task, he’s determined to get it done. His job is to find another archangel that’s hiding in Sleep. To help him, Naasir takes Andromeda along, an angel who’s also a scholar and our heroine. They set off together, challenging each other to a fight and starting to get to know each other, when Andromeda is kidnapped. It’s a go, go story. Naasir and Andromeda don’t stay put for very long. They face terrifying, difficult challenges not the least of which is finding a way to stay with each other after their job is done. The story of how it all works out is nothing short of wonderful and beautiful. We also get snippets from other characters but not enough to deter from the main story or to throw anyone off who is just starting the series. And certainly, it does a wonderful job of getting me excited for the next book in the series. I simply can’t wait. I know paranormal isn’t everyone’s cup of tea but this writer is one to consider. She not only managed to stand out enough all the way from New Zealand that an agent took notice, she’s also on the New York Times Bestselling list again and again. If you’re interested in finding out more, here’s her website and the cover of the book. And yes, I read this one and absolutely loved, loved it. 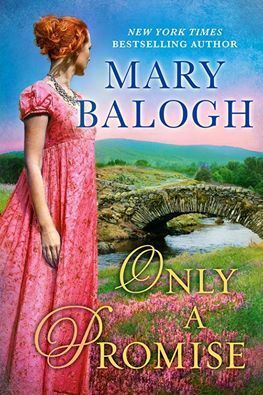 Mary Balogh is amazing. I would love to visit England for the summer. I’ve been and it’s just beautiful, full of incredible culture and wonderful people. True, my hubby is British, so I’m a little biased. If I had to choose another destination, I’d love to see the East Coast of Canada. Halifax and Nova Scotia. They’re gorgeous places and I’ve never been. Depends how long the flight is. If we’re talking only a couple of hours, then I’d reread a book. Right now I’m rereading the Archangel series by Nalini Singh. It’s one of those I keep reading over and over. If the flight was transatlantic, about 6 or 8 hours, then I’d choose a new book. I’d like to take something I haven’t read yet. Right now I’m reading a Chaos novel by Kristen Ashley. It’s nice and thick, she’s a reliable author and I’d love to have a few hours to just read and read. On a very long flight, I’d love to take something out of genre that I would read. I like to read Jodi Picoult…Its not my usual thing but I like the way she writes. Or something completely different for me. Just take a chance and test something off the shelf. You never know what you’ll find! Okay…one thing is obvious, I sure can ramble! Time to shorten these answers! Anything by Susan Elizabeth Phillips. I just finished one by her and she’s outstanding. Though, for honesty’s sake, I’d have to add that reading anything romance cheers me up. Ah…side kick? I thought these questions were going to be easy!….ah….I’m going to choose my doggies…and thank Callum for the idea! Oh…here we are! The end! Hm…who do I tag…hee hee…the power…hee hee. I choose….Infinitefreetime, aka Luther M. Siler. Ha! I love Nalini Singh. She’s one of those authors who’s writing is magical. I can read one or two sentences and, no matter what she’s writing about, I want to continue. Her Psy-Changeling series is absolutely delicious. Like most of her heroes, Vasic is a little scary. He’s an Arrow, a highly trained soldier who’s just that close to being a lethal killer. Vasic admits that he feels very little and his life is pretty hopeless. Still, he feels for the other Arrows and is devoted to duty. His duty is protecting Ivy Jane, our heroine. Like Vasic, she’s gone through horrible trauma and is more than a little apprehensive of him at first. Together, they fight for their people and come to find in each other more than just support but healing and, finally, love. I can give you the gist of what happens but it won’t do the book justice. Nalini Singh, once again, weaves her magic and reading this book is sheer delight. The lines aren’t over the top, the characters are real and attractive, the plot is logical and not contrived. There’s a reason she’s on my automatic-buy list and this book reminded me of it. In fact, I ran to the bookstore to find another of her series that I had managed to miss. If you don’t know Nalini Singh, check her out. She’s a New York Times Bestseller for good reason and, take it from me, she’s reliably amazing. This book is just one of the many she’s written that deserve great compliments. 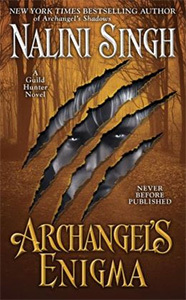 Archangel’s storm is another amazing book from the Guild Hunter series. Certainly one I wouldn’t want to miss. It has a fantastic, powerful hero, a misunderstood heroine and a great plot. I couldn’t put it down. Jason is an amazing hero. He’s mysterious, tough and distant. Incredibly well portrayed, he not only grabbed my interest he managed to be romantic and kind without breaking character. I believed his tender moments and I believed his tough, distant, cold responses. Mahiya is a woman who has suffered and has managed to survive by hiding her true self. She’s cautious and intelligent. It says a lot about Ms. Singh’s writing that she manages to create interest when both her hero and heroine are introverts. In someone else’s hands, these characters might have been doomed. With Ms. Singh, I couldn’t wait to find out more about them. Their romance progresses gently and grows slowly, so we believe it. The reader can see the changes, the way the intimacy and trust grows between the characters. It’s an organic, natural thing that reinforces trust in the writer. There is great danger, intrigue and mystery in Archangel’s Storm but, most importantly for me, there’s a great love story that had me glued to the book. If you’re a fan of Nalini Singh or if you like paranormal, check this one out. You’re in for a treat. “Mahiya was a mystery and Jason did not like mysteries. Pg. 35 from Archangel’s Storm by Nalini Singh. Click on cover to go to site. I couldn’t wait to get this book. Nalini Singh is one of my favourite paranormal authors. She has a way of creating amazing heroes. Men who are flawed but are still awe-inspiring and just a little scary. Janvier is a little different from her usual terrifying heroes but he’s just what Ash needs. She’s a hunter recovering from a traumatic past and someone who won’t let a very grim future get in her way. I won’t go into specifics but I’ll say mention that, if life had dealt me those cards, I would have folded in. Ash, fights her way forward and I loved her for it. We also get to see Raphael, Elena and the Seven which I adored. There are many characters that I truly love in this series and I was so glad we got to see bits of them. The entire world that Ms. Singh has created is so appealing or maybe its just her magical writing. I don’t know. What I do know is that her next book in this series isn’t coming out until the summer and that’s a long time away. If you’re a fan of paranormal romance, don’t miss out on Nalini Singh. She’s absolutely fabulous. You don’t have to follow this series if that’s not your taste, she also has another series on changelings that’s absolutely amazing. Click on the cover below and it’ll take you to her site.